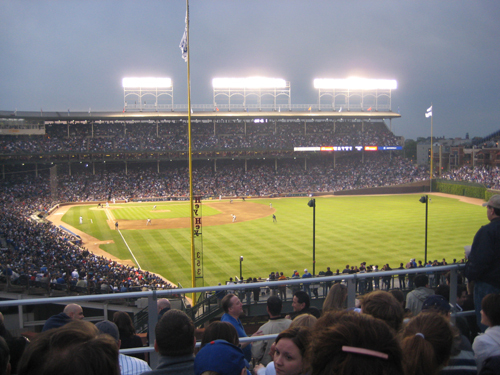 Anyhow, for the uninitiated, the Wrigley Rooftops as they're collectively known are basically auxiliary seating for Wrigley Field. Each establishment has it's own flavor, but most of them offer all you can eat and drink plus a view of the field for a hefty fee. Of course, the price of admission is generally about the same as your typical blearcherite drops on a ticket and alcohol, so really they're pretty much a wash... except you're not drinking Old Style and Bud Light... unless you really want to. Wrigley Done Right, or WDR as I'll refer to them is well named. They're steps from the CTA, and you enter through the back (by the alley.) They have parking if you really need it, but it's pricey and you're likely to see Porsches and Aston Martins. As always, I recommend the El. At the door, you give your name to the doorman, he checks to see you're on the list, and you're in. You climb up to the third floor and there's a large bar in there with a good selection of beer, soda, and other alcohol. If you get there early, you might be able to Shanghai one of the bar stools and park yourself in front of the windows overlooking the park. Here's the view. Since I was more interested in watching the game than hanging out in a bar, I went up to the rooftop. (This may be an unfair critique, but most of the people who were hanging out inside seemed more interested in talking with their friends than watching the game.) The rooftop is where the real action is, because it's awesome. Right as you enter, there is a food and beverage area where you can select from a good variety of food. I've had their hot dogs, bratwurst, and Italian beef... all were excellent. My friend had the hamburger. He thought it was tasty as well. So the verdict is that the food is good. In back of the bleachers, there is also some seating for people who want to take a break from the game, take a phone call, or just hang out in the shade. If you continue to the front of the rooftop, toward the field, there is a large set of bleachers that can probably sit around 100 people. The view into the stadium is very good. You can see pretty much everything except the last 20 feet of right and right-center field. Here's the view. And since still pictures don't give you a great idea of the whole view, I took a little video while I was up there. Here's Aramis Ramirez getting plunked by a pitch and then a sweep of the view. Alright, now for the bad news. • The mens' room is small. I think there's two cramped urinals (and a flat screen TV). If you need a toilet, there's one in the all-comers bathroom next to it, but that line moves pretty slowly. By the late innings, there is a line for the bathroom. In other news, I went to the game (in the stadium) on Sunday. For my post-game write up, catch it at GROTA. The Cubs won their seventh in a row, running their record to a Major League Best 36-21. 15 games over .500. Unbelievable. According to Baseball Prospectus, the Cubs post-season odds are at 80%. I think this just might be the year! Oh, and I almost forgot. I'm working on a little project and needed the Cubs seating capacities for the last few years, so I finally bought my 2008 media guide, pulled my old media guides from storage, and presto! 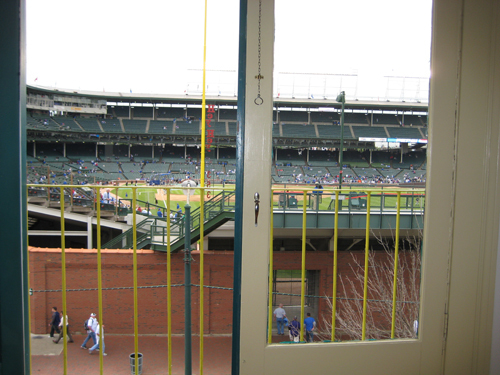 presenting TheCubdom's Official Wrigley Field Seating Capacity page. Enjoy. Tell your friends. Go Cubs! I wonder if this cool Wrigley Field photo was taken from the same rooftop. This guy has some great photos of Wrigley Field. I would guess that it was either taken from Wrigley Done Right or the one just north of it, Skybox on Sheffield. From the positioning on the foul pole, I'm guessing Skybox on Sheffield. Were did you buy your media guide? I can not seem to buy one online. 2008 Chicago Cubs Media guides are available for $15 right outside of Wrigley Field. In the past, I've purchased media guides off ebay if I couldn't make it to Wrigley.